This publication is downloadable in PDF format. 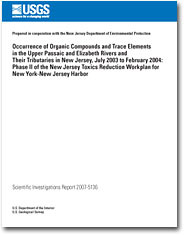 Samples of surface water and suspended sediment were collected from the Passaic and Elizabeth Rivers and their tributaries in New Jersey from July 2003 to February 2004 to determine the concentrations of selected chlorinated organic and inorganic constituents. This sampling and analysis was conducted as Phase II of the New York-New Jersey Harbor Estuary Workplan—Contaminant Assessment and Reduction Program (CARP), which is overseen by the New Jersey Department of Environmental Protection. Phase II of the New Jersey Workplan was conducted to define upstream tributary and point sources of contaminants in those rivers sampled during Phase I work, with special emphasis on the Passaic and Elizabeth Rivers. Samples were collected from three groups of tributaries: (1) the Second, Third, and Saddle Rivers; (2) the Pompton and upper Passaic Rivers; and (3) the West Branch and main stem of the Elizabeth River. The Second, Third, and Saddle Rivers were sampled near their confluence with the tidal Passaic River, but at locations not affected by tidal flooding. The Pompton and upper Passaic Rivers were sampled immediately upstream from their confluence at Two Bridges, N.J. The West Branch and the main stem of the Elizabeth River were sampled just upstream from their confluence at Hillside, N.J. All tributaries were sampled during low-flow discharge conditions using the protocols and analytical methods for organic constituents used in low-flow sampling in Phase I. Grab samples of streamflow also were collected at each site and were analyzed for trace elements (mercury, methylmercury, cadmium, and lead) and for suspended sediment, particulate organic carbon, and dissolved organic carbon. The measured concentrations and available historical suspended-sediment and stream-discharge data (where available) were used to estimate average annual loads of suspended sediment and organic compounds in these rivers. Total suspended-sediment loads for 1975–2000 were estimated using rating curves developed from historical U.S. Geological Survey (USGS) suspended-sediment and discharge data, where available. Average annual loads of suspended sediment, in millions of kilograms per year (Mkg/yr), were estimated to be 0.190 for the Second River, 0.23 for the Third River, 1.00 for the Saddle River, 1.76 for the Pompton River, and 7.40 for the upper Passaic River. On the basis of the available discharge records, the upper Passaic River was estimated to provide approximately 60 percent of the water and 80 percent of the total suspended-sediment load at the Passaic River head-of-tide, whereas the Pompton River provided roughly 20 percent of the total suspended-sediment load estimated at the head-of-tide. The combined suspended-sediment loads of the upper Passaic and Pompton Rivers (9.2 Mkg/yr), however, represent only 40 percent of the average annual suspended-sediment load estimated for the head-of-tide (23 Mkg/yr) at Little Falls, N.J. The difference between the combined suspended-sediment loads of the tributaries and the estimated load at Little Falls represents either sediment trapped upriver from the dam at Little Falls, additional inputs of suspended sediment downstream from the tributary confluence, or uncertainty in the suspended-sediment and discharge data that were used. The concentrations of total suspended sediment-bound polychlorinated biphenyls (PCBs) in the tributaries to the Passaic River were 194 ng/g (nanograms per gram) in the Second River, 575 ng/g in the Third River, 2,320 ng/g in the Saddle River, 200 ng/g in the Pompton River, and 87 ng/g in the upper Passic River. The dissolved PCB concentrations in the tributaries were 563 pg/L (picograms per liter) in the Second River, 2,510 pg/L in the Third River, 2,270 pg/L in the Saddle River, 887 pg/L in the Pompton River, and 1,000 pg/L in the upper Passaic River. Combined with the sediment loads and discharge, these concentrations resulted in annual loads of suspended sediment-bound PCBs, in grams per year (g/yr), of 37 in the Second River; 132 in the Third River; 2,320 in the Saddle River; 352 in the Pompton River; and 644 in the upper Passaic River. Annual loads of dissolved PCBs, in grams per year, are 9.2 in the Second River; 47 in the Third River; 212 in the Saddle River; 349 in the Pompton River; and 549 in the upper Passaic River. Concentrations of total suspended sediment-bound polychlorinated dibenzo-p-dioxins and polychlorinated dibenzo-p-difurans (PCDD/PCDFs) were 6,000 pg/g (picograms per gram) in the Second River; 11,300 pg/g in the Third River; 37,700 pg/g in the Saddle River; 7,140 pg/g in the Pompton River; and 9,640 pg/g in the upper Passaic River. Total toxic equivalence quotients (TEQs), which included PCDD/PCDFs and coplanar PCBs, ranged from 2.7 pg/g in the Second River to 132 pg/g (as 2,3,7,8-TCDD) in the Saddle River. Average annual loads of PCDD/PCDFs were from 1.1 g/yr in the Second River to 71 g/yr in the upper Passaic River. The load of TEQs (as 2,3,7,8-TCDD) from PCDD/PCDFs and coplanar PCBs in the tributaries were 0.5 mg/yr (milligrams per year) in the Second River, 5.8 mg/yr in the Third River, 130 mg/yr in the Saddle River, 46 mg/yr in the Pompton River, and 100 mg/yr in the upper Passaic River. These loads represent an addition to the TEQ load estimated to cross the head-of-tide of 0.1 percent by the Second River, 0.7 percent by the Third River, and 15 percent by the Saddle River. Loads of sediment-bound trace elements mercury, methylmercury, lead, and cadmium were calculated using concentrations obtained from grab samples, which were assumed to represent average annual concentrations in these rivers. Loads of sediment-bound mercury were estimated to be 1,200 g/yr in the Second River; 130 g/yr in the Third River; 4,200 g/yr in the Saddle River; 3,400 g/yr in the Pompton River; and 6,500 g/yr in the upper Passaic River. Loads of sediment-bound lead were estimated to be 56 kg/yr (kilograms per year) in the Second River; 89 kg/yr in the Third River; 1,140 kg/yr in the Saddle River; 310 kg/yr in the Pompton River; and 1,040 kg/yr in the upper Passaic River. Loads of sediment-bound cadmium were estimated to be 1 kg/yr in the Second River; 0.59 kg/yr in the Third River; 60 kg/yr in the Saddle River; 16 kg/yr in the Pompton River; and 11 kg/yr in the upper Passaic River. These loads indicate the importance of the sediment-bound contributions of organic compounds and trace elements to the upper Passaic and Saddle Rivers. Concentrations of suspended sediment-bound PCBs in the main stem and the West Branch of the Elizabeth River were 806 ng/g and 3,100 ng/g, respectively, representing loads of 40 g/yr and 1,150 g/yr, respectively. These loads were estimated using assumed discharge conditions. Concentrations of suspended sediment-bound PCDD/PCDFs were 7,270 pg/g and 9,980 pg/g in the main stem and West Branch, respectively, representing average annual loads of 0.36 g/yr and 3.7 g/yr, respectively. Total TEQ loads (sum of PCDD/PCDFs and PCBs) were 2.1 mg/yr (as 2,3,7,8-TCDD) in the main stem and 34 mg/yr in the West Branch, respectively. These load estimates, however, were directly related to the assumed annual discharge for the two branches. Long-term measurement of stream discharge and suspended-sediment concentrations would be needed to verify these loads. On the basis of the concentrations measured in this work, it appears that the West Branch is the principal source of PCBs, PCDD/PCDFs, total TEQs, and metals to the main stem of the Elizabeth River. Additional sources of these constituents may exist between the confluence and the head-of-tide.